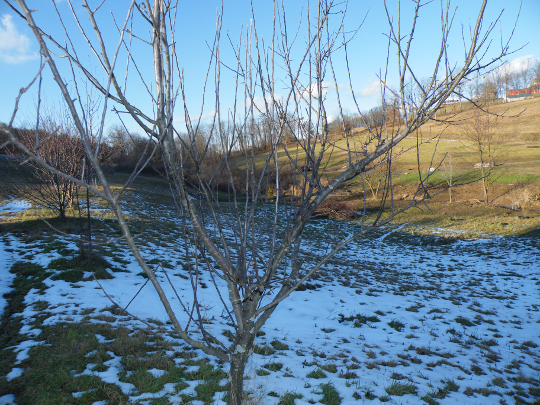 January is here, and so is my que to prune the fruit trees on the farm. I have been waiting for a good cold frost to put the trees in a deep slumber, and mother nature helped a week or so ago with some very cold days. After those few days I was convinced that the weather would stay cold for the next month or two, and that I would be forced to prune the trees while battling the cold. When the mercury rose above freezing over the weekend, I figured it would be best to work with nature, and take the time to prune the trees while it was warm. When pruning trees, you need a sharp blade on the cutting instrument. This is true whether your using a chain saw, pruning shears or a hand saw. Dull blades tend to damage the tree in much the same way that a dull blade produces a far worse cut on your skin then a sharp blade. A sharp blade produces a clean cut which is easier for the tree or skin to recover from. When cutting off branches it’s important to leave a small nub behind where the branch purtrudes. I’d recommend leaving about a half inch to an inch depending on the size of the branch being cut off. There is a special cushion zone in this part of the branch that allows the tree to scab over easily. You can see this as the branch thickes a bit right before connecting to the trunk. If you cut this cushion zone off, the tree truck itself will be susceptible to disease and premature rot. The ideal tree branch will seperate from the tree trunk at a 45 Degree angle. You can see this angle in the photo below. The two lightest colored, and thickest branches form and angle of about 45 Degrees. This angle allows the branch to hold a lot of fruit, and not break. 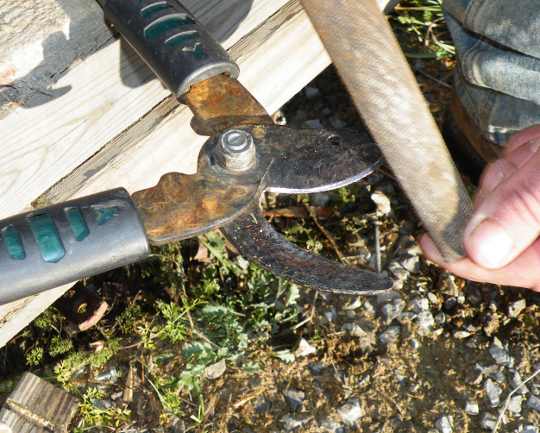 I generally prune branches that point downward, or directly out at a 90 Degree angle. It’s also important to prune vertical branches so that two close branches aren’t competing for the same area. The weeker of the two should be cut. Remember that pruning is not an exact science, but even if your just learning, it will still be beneficial to your trees. This is my second or third year of pruning, and each time I practice the trees reward my efforts with larger yeilds and larger fruit. 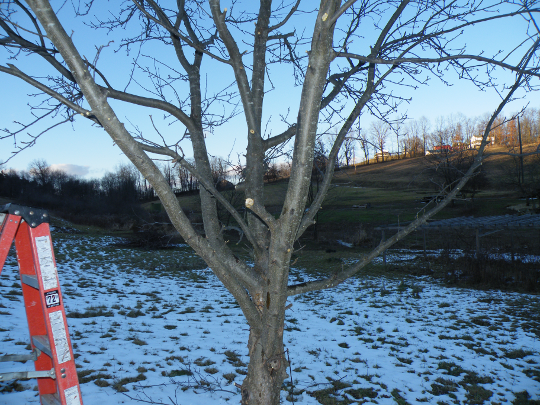 One of the largest trees in the front orchard is a apple tree that grew on it’s own. When this little tree first began to grow we didn’t know what it was and we were constantly running it over with the lawn mower. The tree never gave up, and grew fast, until it was too big for the mower to pass over, and which point we decided to let it grow and see what kind of fruit it produced. The tree finally grew large enought that it required pruning, and so I basically chopped all of the lower branches off so I could mow around the tree without losing my hat. This along with good weather for apples allowed the tree to grow lots of large apples, which we made into dozens of jars of apple sauce. After pruning many of the fruit trees in the front of my home, Davy and I moved onto the grape vines, pruning two of three arbors. When pruning the grapes, I made it a point to cut anything hanging over the arbor, and I cut some very large vines. Grapes will only grow from new first year growth, so the older vines are using up some of the resources the plant could be using to produce grapes. 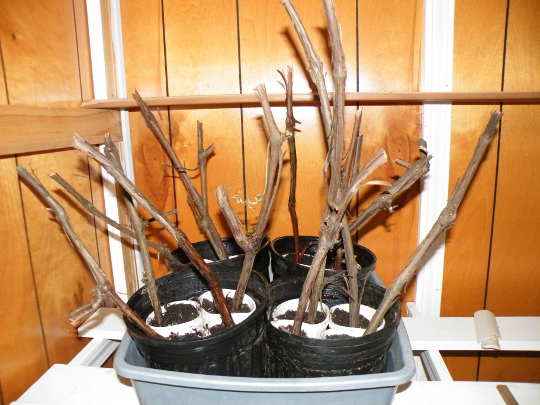 I then selected some cutting which I hope to grow into new vines when they grow new roots. If your interested in doing the same, check out: Propogating Grapes Revisited.